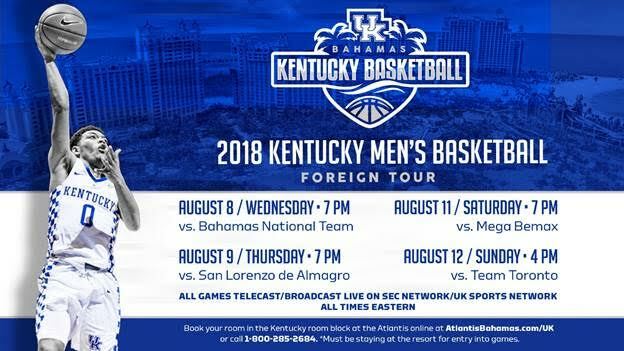 LEXINGTON, Ky. – It won’t be able to replace the paradise that’s just outside the arena, but for Kentucky men’s basketball fans who are unable to make it to the Bahamas in August for UK’s foreign exhibition tour, they’re still in luck: The SEC Network will televise all four games from the Atlantis on Paradise Island. The ESPN college basketball crew of Tom Hart (play-by-play), Seth Greenberg (analyst) and Dan Dakich (analyst) will be on the call to bring fans all the game action, live from the Bahamas. Additionally, the UK Sports Network, with Voice of the Wildcats Tom Leach and UK Athletics Hall of Famer Mike Pratt on the mic, will broadcast all four games on 630-WLAP, its affiliates across the state, on UKathletics.com and the UK Athletics app. 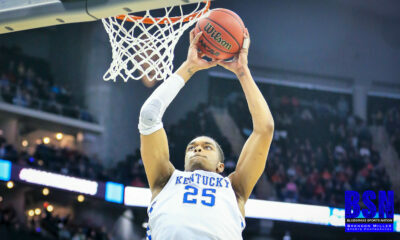 Exclusive behind-the-scenes coverage will also be available on UKathletics.com and CoachCal.com. With TV and radio coverage finalized, tip times for all four games have been set. The first three games will tip at 7 p.m., with the finale on Aug. 12 slated for 4 p.m.
A full schedule of the games is below. Tickets and hotel accommodations are still available for fans to join the Wildcats on Paradise Island for the Wildcats’ four-game, eight-day trip from Aug. 6-13 as UK trains and prepares for the 2018-19 season. Travel packages, which vary from as little as $188 to $438 per night for a stay at the Cove at the Atlantis, are available and include a variety of options. Fans won’t have to leave to resort as all games will be played at the Atlantis Imperial Arena, where Kentucky played Arizona State during the 2016-17 season. Rooms at the Atlantis can be booked online at AtlantisBahamas.com/UK or by calling 1.800.285.2684. Fans must stay at the Atlantis resort for entry into games. Tickets can only be purchased if you have a room reservation at the Atlantis. You may purchase tickets online through the UK Ticket Office via the exclusive link at AtlantisBahamas.com/UK once you have booked your room reservation in the Kentucky block. Tickets are not included with hotel packages and must be purchased separately. Ticket books are priced at $400 each and will include entry into all four games. Children under the age of 2 will not require a ticket for admission. Tickets will be mailed upon purchase. All seating is general admission, except those held for team guests. 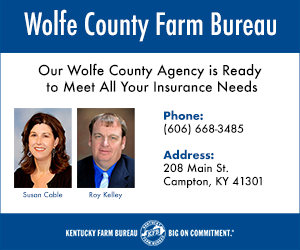 K Fund members interested in the exclusive travel package, including charter flight from Lexington, may call (859) 257-6300 for more information. As aforementioned, fans must stay at the Atlantis to attend games. Four-night minimum accommodations at the Atlantis are available. Nights may be added to the stay before Aug. 6 or after Aug. 13. All taxes and fees are included when booking rooms. Official group transportation through Majestic Tours will be available for a special rate. 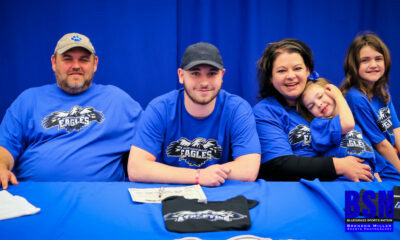 UK is coming off a 26-11 season that resulted in another Sweet 16 berth – UK’s seventh in nine seasons under Calipari – and the Wildcats’ fourth straight Southeastern Conference Tournament title. The Wildcats must find a way to retool after losing three of its top four scorers in Kevin Knox, Shai Gilgeous-Alexander and Hamidou Diallo, who were selected in the 2018 NBA Draft, but Calipari has found a way to do so with a roster packed with talent, experience and versatility. Kentucky will welcome significant contributors from its 2017-18 team with PJ Washington, Quade Green and Nick Richards, plus redshirt freshman and highly touted shooter Jemarl Baker. That group of returners – which will mark the highest returning production of points and rebounds since the 2014-15 team that went 38-1 – will join yet another star-studded recruiting class that includes Ashton Hagans, Tyler Herro, Keldon Johnson, EJ Montgomery and Immanuel Quickley. UK has also added graduate transfer Reid Travis, a two-time First Team All-Pac-12 selection who averaged 19.5 points and 8.7 rebounds last season. NCAA rules allow for a foreign tour by an intercollegiate team once every four academic years. Kentucky’s Big Blue Bahamas tour is a joint venture between Complete Sports Management and the Bahamas Basketball Federation. The tour should prove to be instrumental in the early development of yet another young team that already has the likes of Duke, Kansas, North Carolina, Louisville, Utah and Seton Hall on its nonconference schedule. Fans will remember the Bahamas served a similar purpose for UK’s memorable 2014-15 season. The Wildcats tipped off their 38-1 season with a 5-1 mark vs. the Dominican Republic national team, the Puerto Rico national team reserves and French first-division club team Champagne Chalons-Reims Basket in the Bahamas. It was the start of magical season that ended with an undefeated regular season, SEC regular-season and tournament titles, and a trip to the Final Four. Coinciding with the UK men’s basketball trip will be the seventh annual John Calipari Basketball Fantasy Experience. For the first time in the event’s history, the fantasy experience will be held outside of Lexington. More information on the John Calipari Basketball Fantasy Experience and details on how to register are available at johncaliparibasketballexperience.com. For the latest on the Kentucky men’s basketball team, follow @KentuckyMBB on Twitter, Facebook, Instagram, and on the web at UKathletics.com.